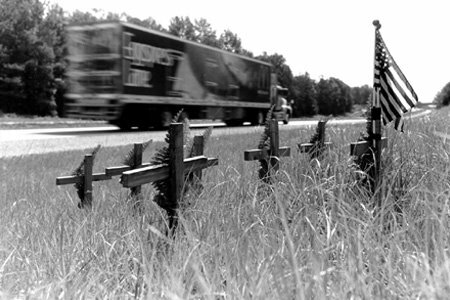 The New York Times recently had an article on the proliferation of roadside memorials, which indeed seem to dot — if not now, then soon will be — each and every mile of America's highways and byways. 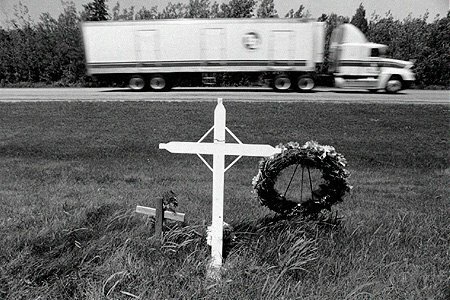 Usually DIY affairs crafted out of crosses, balloons, teddy bears, flowers and Ziplocked photos but now can also be purchased commercially from online sources such as roadsidememorials.com, they are the very intimiate and very public lamentations for loved ones killed in auto accidents. They mark and sanctify where death had occured. But those expecting Varanasises to start materializing alongside the Lincoln Highway or L.I.E. or the Dan Ryan Express or some other concrete Ganges meandering through the American landscape may have to temper their daydreams for a bit, as anything in the US that rests on some mercurial internal logic, such as memorializing our dearly departed, will invite twitchy, bureaucratic fingers to rein all of that in with central, regulatory control. 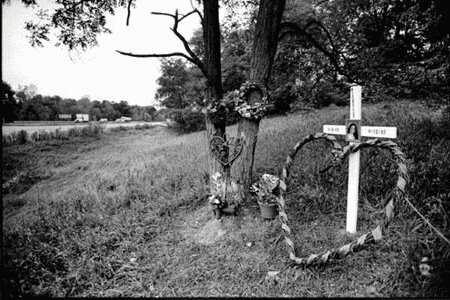 1) It's only a matter of time (if not already) before roadside memorials become as iconic as the Land Survey grid, the gas station and the clover-leaf highway interchange — that is, a crucial part of the parageographic experience of the American landscape. 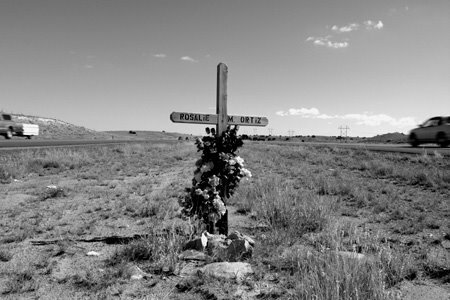 2) We should definitely reinstitute the ancient practice of siting cemeteries along traffic arteries: the celebration of death again a part of daily life. Besides the occasional shuttered malls, exuberant auto dealerships, and monolithic grain elevators, the ride up to Chicago from points southern can be intensely boring, even the political billboards and “Adult” signage have lost their amusement value after several passes. But what if Interstate 57 looks decidedly Roman or Subcontinental — or imagine a hysterical combination of a Hindu cremation ritual, a New Orleans jazz funeral march, Jim Crace's quivering, and a High Baroque Requiem mass plus the nonstop visual, aromatic and aural assault from this thanatological mixture. The drive can be much livelier, in other words. 3) Why not a pyramid or a baker's tomb or statues in relief and in the round or an Eisenman or the winning entry in the Annual International Roadside Memorial Student Design Competition? 4) In a hundred years or in the next decade, pilgrimage routes crisscrossing the country will be very much well-established with all the varying roadside caravansaries stitched scenographically together — a tourist circuit populated by fans of vernacular America and by readers of Roadside(memorial)america.com. "besides the occasional shuttered malls, exuberant auto dealerships, monolithic grain elevators"
It's a case of two needs satisfying each other. Roadside America neeeds its attractions back, while martyred pilgrims of the highway need a dignified place of rest. So, those shuttered shops, those haunted dealerships, and those concrete hexaliths become mausolea for a restless, ever-drivin' nation. You think New Orleans is necroplis by another name? Well, just wait til those Illinois landscape architects get to work on this project. Very, very true. They are already memorials. So then maybe they ARE mausolea of martyred pilgrims: shuttered malls as cryptoriums, grain elevators as ossuaries, and left-over wreckage as coffins parked in disused auto dealerships. And not merely a memorial to inorganic academic concepts. Rather actual corpses entombed. Real rotting dead bodies. A linear, thinly gerrymandered necropolis along the entire length of the American intercontinental highway system. And not simply "occasional." Okay, you've compelled me to muck around with this a bit longer. But there's no promise anything more substantial will come of it! 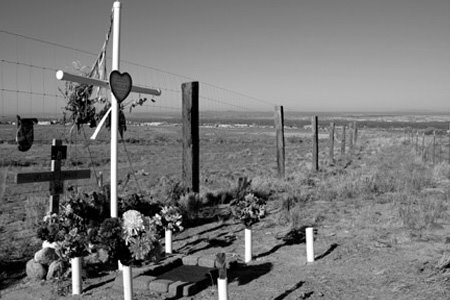 One, Sampson's work comes across as a heartfelt reflection on the deaths of many individuals. So nothing I say should be taken as dismissive of that. (The caveat is because I know too many people that just can't fathom anything but direct and literal meanings.) It is more compelling because the memorials reflect an individualist paradigm that runs through so much of American life. So ideas about less personal responses (names on bricks, for example) seem inadequate. Two, there's already a philosophy of remembrance out there for the picking. Three, I hate blogger comment-editor! In Italy they are called "Altarini". little altars. fucked-up blogger comment editor does it again. They could do a wysiwyg editor for that function. But do they? call me heartless, but I see these things as litter and I'd mow them all down. Everyone dies, why is it special if your loved one died in a car crash? I see some of them to be trashy, like when they put every thing but the kitchen sink by the raod. I don't se anythin wrong with puting up a cross with thiere name on it. But when you put the cross flowers and some other things out all out in one small place it's just trash. Sorry if that afends you but it's the truth.